Series of Four Garden Urns with Pedestals, circa 1950 Made in England, circa 1950. 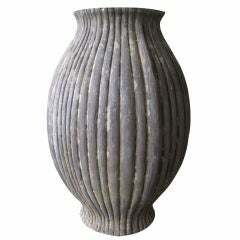 Large cast stone urn with pedestal, circa 1950. Impressive scale, with wonderful patina and original lichen. Decorative cast stone urn with pedestal, circa 1950. 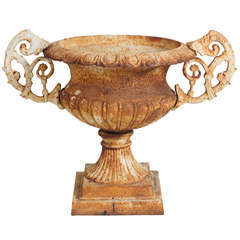 Beautifully cast urn with decorative flower motif. Pair of painted cast iron uns, circa 1950 Decorative cast iron bowls on square pedestals with original period finish and oxidized patina. Westonbirt cast stone urn and pedestal, circa 1970. Impressive form with beautiful patina and original lichen. 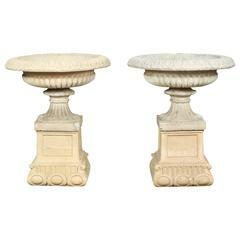 Of classic form on later bases of cast material similar to Haddenstone. 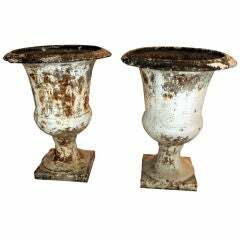 A gorgeous pair of Directoire Painted Garden Urns from the late 1700s.